Water additive fire extinguishers are beginning to grow in popularity as a smaller and lighter alternative to traditional water canisters. 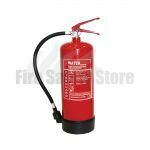 The water additive fire extinguisher has an environmentally friendly additive within the water which significantly increases the effectiveness of the extinguisher by reducing the surface tension of the water. 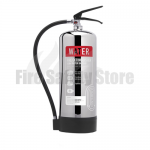 This means that compared to a standard water fire extinguisher, a water additive appliance can be lighter and smaller and yet still be more effective than the ordinary water extinguisher. 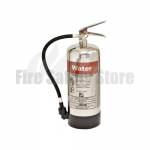 Water additive fire extinguishers are much lighter than traditional water firefighting canisters. The additives involved mean that 6 litre additives have a higher fire rating than 9 litre standard water extinguishers. This means that facing a fire is an easier task without the labours of having to lug a huge 9 litre canister. Additives also result in an extinguisher that can deal with fires at a quicker rate as not as much is lost or wasted. Water additive extinguishers are manufactured with spray nozzles. The difference between these and standard nozzles is that the spray versions allow for more effective arc spray that can more competently deal with fire. Just as with traditional water extinguishers, water additive varieties should also be colour coded with a red label for easy identification. They should also only ever be used on Class A fires – fire involving solid materials such as wood, paper and textiles. Although water additive fire extinguishers should never be used on electrical fires, the additives make any splashes coming into contact with live power less dangerous as long as they are not directly sprayed. It is also important to note that if used on other types of fire. If used on Class B, D and F fires, flammable liquids, metals and oils may be spread over a larger surface area causing fire to spread and get out of control. Fire Safety Store offer water additive fire extinguishers in two sizes – 3 litre and 6 litre. Both are lightweight and can generally fight fires at a better rate than 9 litre standard water fire extinguishers. Both of these, just as with all of our extinguishers, are supplied with wall mounting brackets for easy fitting, storage and access should they ever need to be called upon. If you have any questions, queries or comments involving water additive fire extinguishers, or indeed any other item from our range of products, please do not hesitate to call us on: 0800 3160890. Don’t forget, next working day delivery is available on all orders that are placed before the 2pm cut-off point.